The way every PU student would choose while considering a college is very different from the way his/her parent does. While most parents look at the academic, educational, and financial aspects, students normally look at the hangout places around, or simply the kind of popularity that it holds among their seniors and friends. All these are important for a complete college experience. So, Jain College, considered to be one of the best PU colleges in India, offers some of the most sought-after opportunities to help make the two years worthwhile. The primary goal and that is everyone's concern is academics. Even if many colleges offer the course that you are looking for, the way it is imparted matters a lot. Although the syllabus is established by the governing body, the pedagogy is often decided by the college. Apart from the basic framework laid down by the governing body of instructing the course to the students, the college is often given the liberty to improve on it. Jain College is very adept at getting across the subjects catering to all the students accordingly. The subjects offered here are from all the three major streams of Science, Commerce, and Arts. They include Physics, Chemistry, Biology, Mathematics, Computer Science, Electronics, Accountancy, Business Studies, Statistics, Economics, History, Sociology, and Psychology. These are the most common subjects offered around the country, but the dedicated and trained faculty bring the subjects alive. The faculty is handpicked with the right intention. They are not selected based on their teaching and academic skills alone. They are preferred by their interpersonal interaction, sensitivity to the students' needs and the way they make themselves available to the current educational scenario in boosting the student fraternity in the right way. Regular reviews are maintained to keep a tab on the performance of the teachers and are accordingly assisted to improve. They are also given regular sessions of Faculty Development Programs (FDP's), workshops, and support to make them better at what they do. They are motivated to be dependable guides to mentor students in their everyday choices, given the fact that they both spend a considerable amount of time every day. While the PU phase bridges the gap between school and a professional course, this period means that the students are especially in need to make wise and satisfying decisions regarding future courses or careers. They need to be given the various options available in and outside the country and then shown how they can access it. But before that, they must be helped to understand where their interests lie, what they aspire to do and how they can achieve that. Teachers and professional career counselors are available to help students make those choices with confidence. Some of the best PU colleges in the country follow this system to equip the students with the right career and further studies support. The facilities and infrastructure is something that cannot be missed. They are those parts of the college and academic life that supports the growth of the student in every way. The college avails many facilities like an updated library, technology-enabled classrooms, fully furnished science labs, seminar halls, a gym, an auditorium, a multi-cuisine cafeteria, and accommodation. Being one of the best PU colleges in Bangalore, sports facilities provided by Jain College are aplenty. Students are always encouraged to participate in at least one of the many sports events and sports aspirants are given as much support as required through the excellent coaches, opportunities to participate in events and tournaments and even financial aid is provided for those in need. Student-friendly facilities or student-support is of utmost value at Jain College. Value vision is provided through Human Networking Academy to help educate and empower people. This applies not only to the students but also to the staff and parents as well. Deserving students are given rewards and recognition in various fields of achievement from time to time to encourage them. Scholarships under different categories like academics, sports, music and dance, literary, and specially challenged categories are given to deserving and requiring students. What is college life without clubs and activities bringing students together to grow, learn, and work as a team for a common cause? 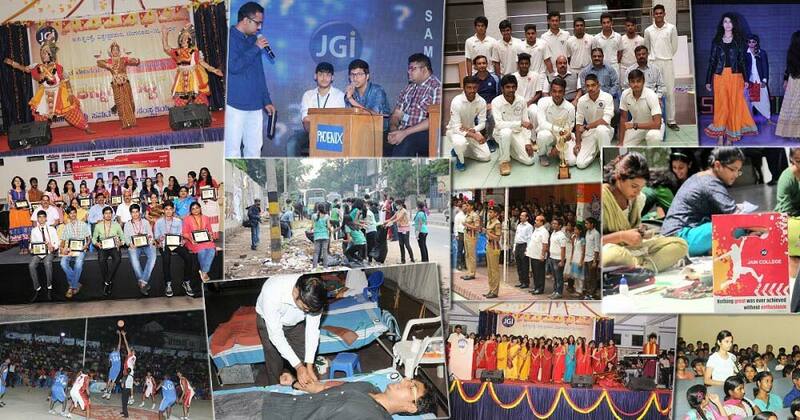 Jain College hosts a number of clubs and forums to bring out the best in students and enjoy themselves. The Kannada Vedike, Hindi Parishad, Eco Club, Cultural Forum, Literary Forum, and the Commerce Forum are some of the clubs that conduct many events around the year. Events and festivals such as the Kannada Rajyotsava, Guru Poornima, Green Day, etc. are celebrated to instill values, respect, traditional & cultural tolerance, environmental responsibility and, a sense of community among the students. The key is that every student is given an opportunity to express and learn from each other through these internal communities. Academic fests help the students to explore their elected subjects in a deeper and more interesting manner. Jain College is known to conduct Electronika, the inter-collegiate Electronics fest, and Product Launch. India, being a multi-lingual country, inspires the college to have its own literary forum that conducts Manthana, the literary fest. This fest works at inculcating love and respect for lingual and literary activities among different languages. Other cultural fests like Udhbhava (intra-collegiate), Srishti and Anveshana (both inter-collegiate) are all conducted annually to encourage students to have a holistic growth. These events and activities help in improving the students' academic, intellectual, competitive, managerial, leadership, creative, literary, social, artistic, musical, and dramatic skills. It is a way of exposing them to various opportunities and their own talents. The student community at Jain College is vibrant and with a mix of many languages, cultures, ethnicity, and countries. This makes it a great place for the students to be exposed and interact with a variety of people, helping them to learn and respect others' preferences and interests. Creating such global but inclusive sentiments build the students to embrace and practice empathy, consideration and foster great friendships, exposing them to life's events in a meaningful way. The two years of PU can be for a short period, but it is an impactful one. One must choose the best social environment and invest in the best-known place for a healthy and supportive base for choices made further on. The right attitude is often what everybody looks for. But one can need to make the right choice of place to secure the many factors that together build that right attitude in you.